The moment you have kids, your life as a woman drastically changes. Every decision you make is all about your family's welfare: your husband, your children, your home life. For some moms like me, your career takes on the backseat as you put your family's needs first. The first thing that comes into mind when a mother stops working from her corporate job is, can we afford to live on just one income? The short and practical answer is probably no, because life in general nowadays is expensive. Which is why getting an online job is a very likely option for many moms who decide to stay at home. Last year in mid-2017, I gave birth to our first baby and transitioned from being an office worker to a work-at-home mom. It's the best decision I've ever made, but if truth be told, it wasn't a decision we took lightly. It took us months to finally make the big leap of becoming a full-time work-at-home mom. Working online isn't as easy as it sounds. Freelancing means being on both ends of the employment spectrum at regular intervals: sometimes you earn big and sometimes you earn nothing. With a corporate job, you have the stability of expecting a somewhat set income twice a month. With freelancing, on the other hand, it's a constant chase of getting clients to earn money. And when you're still starting out, your rate depends on the type of project and your skills, which means that if you're relatively a neophyte, you'll be offered a lower rate. How much does your husband earn? How much do you currently earn? How much is your household's fixed monthly expenses? Are both your incomes enough to cover it all? How much spare money do you have to cushion your family through the brief weeks or months of adjustment from being a corporate worker to a freelancer/online worker? How much money do you need to earn in order to cover your household expenses? Bonus Tip: You can opt to find an employer who offers a full-time, permanent, and remote job where you can work from home most of the time, or all of the time. Many moms worry that they don't know what kind of job they will be doing outside of the structured corporate world. The good news is, there's a wide variety of online jobs you can do, such as writing, copyediting/proofreading, data encoding, translation, teaching, graphic design, web development, accounting, admin tasks—and the list goes on. As reference, you can browse through the available jobs in onlinejobs.ph and see if there are jobs that you might like. Assess your skills and experience. You don't necessarily need to have a formal training or a degree to be qualified for a freelance job, though it does help sometimes. I myself work as a writer, but my official degree is BS nursing. What are you good at? What skills or hobbies are you passionate about? What job experience did you have before, both in school and in the corporate world? What tasks do you enjoy doing? 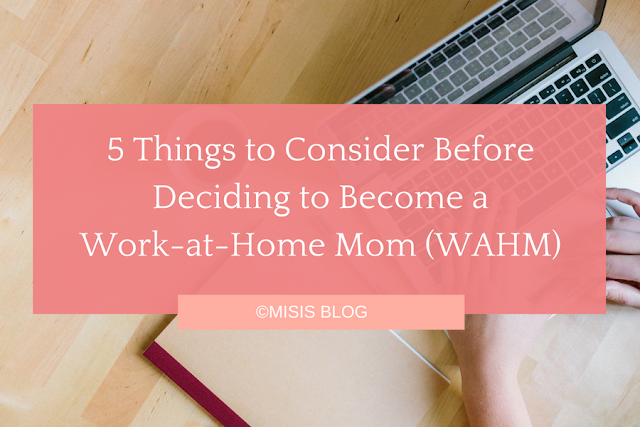 The biggest challenge I faced when I started out working from home was managing my time. I only have one kid for now, but it seems like she's taking most of my time, and that's only for taking care of her (i.e., bathing, feeding, breastfeeding, playing, etc.). And then there's your online job and housework. How much time are you willing to dedicate to your online job? Can you work part-time (4 hours a day) or full-time (8 hours a day)? What timeframes of the day is your kid asleep or otherwise occupied (for example, in school or during playtime)? What days of the week are you most available? Bonus Tip: It helps if you could find a job that offers flexible hours. For example, you can work 2 hours in the morning, then another 2 hours in the afternoon, and 4 hours at night. It truly takes a village to raise a kid, especially when you decide to work at home. While I salute mothers who can do everything—from taking care of your baby, to doing housework, to having an online job—I'm one of the many mothers who can't, so I hired a househelp who can help me with the household tasks and look after my baby while I work at home. Do you live with other family members who can help you at home while you work? Do you have funds to hire a househelp? Of course, all these things won't matter if you're not emotionally ready to make such a huge decision. Working from home means being in a "work" environment that's entirely different from what you're used to. For one thing, you won't have a lot of diverse social interaction at home; it's just you, your baby, your partner, and whoever lives with you. For some, this entails a lot of adjustment to do, especially if you're an extrovert. But even introverts like me also found it difficult at first. Are you ready to go out of your comfort zone and plunge into the unfamiliar? Are you ready to have lesser social interaction (no more office gossip, lengthy meetings, or organized employee engagement activities)? Do you have a circle of friends you can depend on (albeit virtually) if you feel stressed out at home? Can you handle working independently? Working from home has all its perks, the main one being having more time for your family. However, it's not something you decide on in just a snap. Consider your family's unique circumstances. Every family is different, so what might have worked for us may not apply to you. If it helps, pray for discernment. I did, and God did not disappoint. Good luck and God bless!